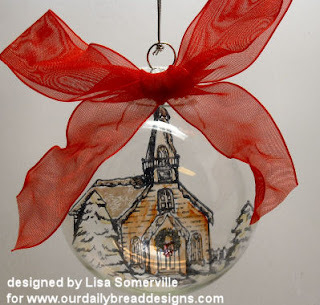 Using the Alcohol Ink Technique and the Worship the Lord image from Our Daily Bread Designs, I created this beautiful Holiday Ornament. I used my White Gel Pen to add white to the rooftop, trees and grass. To antique the Red Organdy Ribbon, I heated it slightly with my heat gun. Be sure to stop by Pat's Blog to see the other TJ Blogstravaganza Links. What a beautiful ornament. Did you just stamp on the acetate and roll it up and stick it inside? I love it!